This workshop is aimed at ALL abilities, which works well as everyone bounces ideas off each other and the beginners learn from watching the more experienced felters handling materials. A scarf makes a marvellous first project. 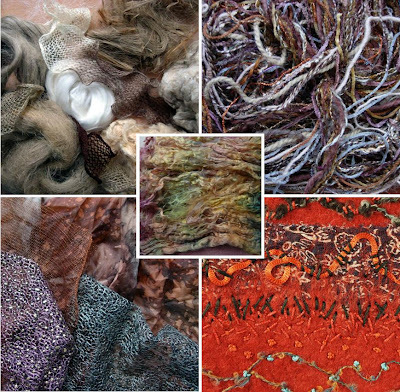 There's plenty of practice in laying out fibres, with scope for experimenting with colour & texture and there's the added sense of achievement in being able to make something so very unique and wearable in just a day! I will be demonstrating different techniques and will have a range of scarves on display. There will be simple ideas for beginners to try, such as a lattice scarf, plus advanced techniques such as nuno felting. You can decide on the day, and maybe even make two..? I have been asked about holding a scarf workshop for a long time now and the difficulty has been finding a venue where everyone has plenty of room to work. Well, problem solved ! We have found a suitable place in Newport and there are two workshops scheduled - see here for all the dates & details. 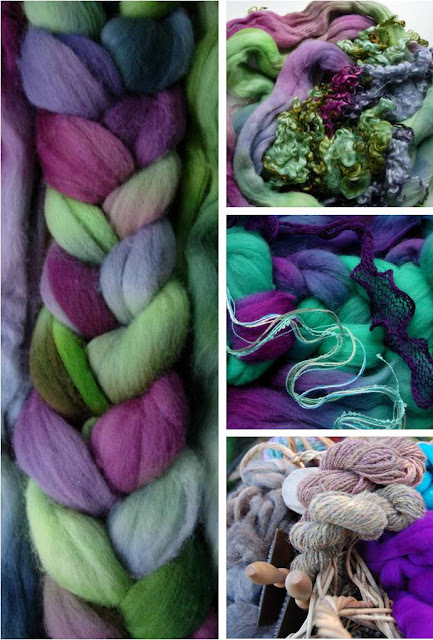 'Experimenting with Textures' is for those who have some felting experience, but haven't yet tried using the amazing range of alternative fibres available. These are not just the animal fibres like alpaca, silk or mohair that we are familiar with, but have you tried using banana, jute, soya, bamboo or even crab fibre? Some of their unique characteristics I'm only just discovering for myself! They can be used to great effect to give texture and form to fibre pictures or 3-dimensional pots & bowls. 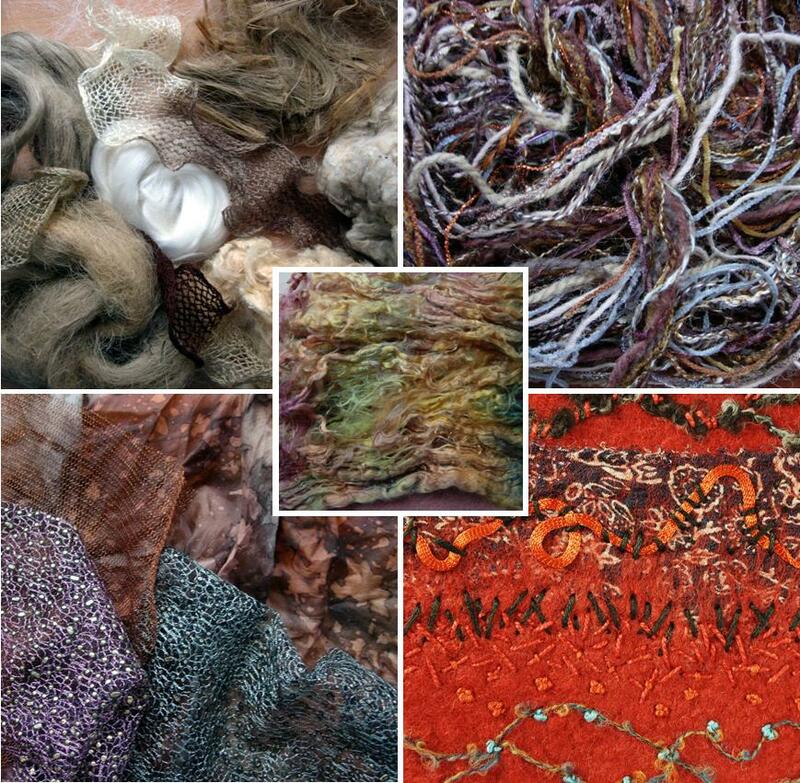 All these textured fibres will be provided in this workshop, along with other organic and synthetic yarns & fibres. You can come along and explore the different effects by making a series of sample pieces or use them to create a 3-D project. I'm really looking forward to these workshops as well as all the others in the new programme for 2012. I know many of you have booked up already as a number of the workshops in Freshwater & Newport are full, so I look forward to meeting up with you again soon. All the very best for this NEW YEAR... And enjoy your felting! PS. I shall be posting up some photos of the new scarves and texture samples just as soon as they're finished… They can now be seen here.